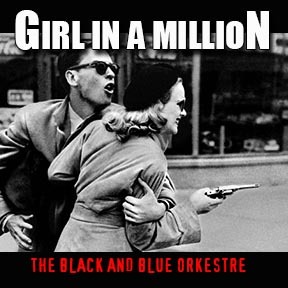 “The Black and Blue Orkestre are pleased to announce their new single, GIRL IN A MILLION. The track is the latest from core Black and Blue members Tom DiCillo and Grog Rox. Written by DiCillo the song is an edgy, groove driven, noir ballad that has Grog sharing the lead vocals. Guest guitarist Wayne Byrne provides the aching, moody twang. Wayne Byrne is an Irish writer, musician and esteemed film scholar. He contacted me several years ago with the suspicious intent of writing a book about me. Five years later Wayne has completed the first book on me and my films; INCLUDE ME OUT, The Films of Tom DiCillo. The book covers all my films from Johnny Suede to When You’re Strange and is comprised of in-depth essays on each film by Wayne as well as a series of equally probing Conversations between the two of us. Wayne is currently submitting the book to publishers. Listen to his guitar playing while they make up their minds.